The Board of Intermediate and Secondary Education Sargodha is one of the oldest board of education of Pakistan. It was established in 1968. The Boards of Education are independent bodies, they have legislative authority to renew, review, reform, process, investigate, cancel, develop and operate the academic and administrative policies of educational institutes affiliated to it. They were established as governmental tools to monitor development of education and implementation of educational plans in the specific areas prescribed to the boards, with precision. The current model for boards of intermediate and secondary education is under authority of Governor of the province. BISE Sargodha Board has responsibility to conduct examinations, prepare results, and manage funds for educational institutes, monitor standards of education in public and private institutes of the area are met in the prescribed manner, provide instructions specified by Ministry of education to affiliated institutes, oversee the availability of facilities in the institutes, monitor and investigate education system, cancel, accord and withdraw affiliation certificate and also monitor execution of curriculum has been done in prescribed manner by the affiliated institutes. The areas falling under jurisdiction of BISE Sargodha Board is consisted of: Sargodha District, Khushab District, Mianwali District and Bhakkar District. Sargodha is one of the most populated and largest cities of Pakistan. It is host to many paramilitary training and educational institutes. Areas of Bhera, Bhalwal, Kot Momin, Sahiwal, Sargodha, Shahpur and Silanwal are included in Sargodha District. The education rate of Sargodha district is 73%, 63% in Khushab District, 63% in Minawali District and 58% in Bhakkhar district. Through the means of BISE Board of education, the government encourages enrollment of maximum students in the small cities and districts. The aim is to provide uniform education system to every student of Pakistan. The students belonging to every city of Pakistan must acquire same quality of education as those belonging to mega cities of Pakistan. 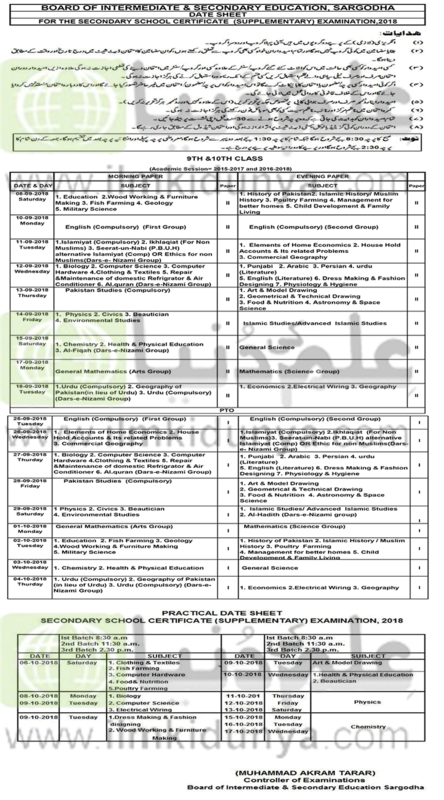 The BISE Sargodha board is consisted of: Store Branch, General Press, Estate Branch, Admin Branch, Finance Branch, Registration & Admission, Welfare Branch, Research Branch, Physical Education Branch, Record & Litigation Branch, Secretary Personal Staff, Examination Branch, Certificate Branch, Computer Cell, Secrecy Branch, Conduct Branch, Confidential Press, Controller Personal Staff and Audit Branch. BISE Sargodha Board has been working in a very well organized manner, it has its own budget and management system. All results and date sheets of BISE Sargodha Boards are announced on its official website. The Board has the responsibility to conduct fair and unbiased examinations. The performance of board of education depends upon the passing percentage of students every year. The board has to ensure the education system of its jurisdiction areas develop in continuous rate. The board has authority to investigate administration and faculties of all its affiliated public and private institutes. The inspection teams of BISE Board Sargodha visit every examination centre during examinations to make sure there is no cheating and deformity in conduction of examinations. Ilmkiduniya update supplementary and annual date sheets of examinations of BISE Board of Sargodha.